CLINICAL PHARMACOLOGY: Potassium ion is the principal intracellular cation of most body tissues. Potassium ions participate in many essential physiological processes, such as the maintenance of intracellular tonicity, nerve impulse transmission, enzymatic reactions in intermediary metabolism, cardiac, skeletal and smooth muscle function, and the maintenance of normal renal function. Potassium depletion may occur whenever the rate of potassium loss through renal excretion and/or loss from the gastrointestinal tract exceeds the rate of potassium intake. Potassium depletion usually develops slowly as a result of lengthy therapy with oral diuretics, primary or secondary hyperaldosteronism, diabetic ketoacidosis, or inadequate replacement of potassium in patients on prolonged parenteral nutrition. Depletion is additionally associated with severe diarrhea, accompanied by vomiting. Potassium depletion due to these causes is usually accompanied by a concomitant loss of chloride and is manifested by hypokalemia and metabolic alkalosis. Potassium depletion may result in fatigue, weakness, nausea, drowsiness, loss of appetite, edema, oliguria and chronic ileus with distention. Potassium deficiency may be manifested by shallow breathing, lowered blood pressure, disturbances of cardiac rhythm (primarily ectopic beats), prominent U-waves in the electrocardiogram, or other ECG changes, such as lengthened Q-T interval, depressed S-T segment, and depressed or inverted T-wave. In advanced cases of potassium deficiency, flaccid paralysis and/or impaired ability to concentrate urine may be evident. nephropathy, and certain diarrheal states. CONTRAINDICATIONS: Potassium supplements are contraindicated for patients having hyperkalemia, since a further increase in serum potassium level in these patients can results in cardiac arrest. Hyperkalemia may complicate any of the following conditions;chronic renal failure; systemic acidosis, such as diabetic acidosis, acute dehydration; extensive tissue breakdown, as in severe burns; adrenal insufficiency. Hypokalemia should not be treated by the simultaneous use of potassium salts and a potassium sparing diuretic, such as spironolactone or triamterene, since the concomitant use of these medications can result in severe hyperkalmia. WARNINGS: The administration of potassium salts can produce hyperkalemia and cardiac arrest in patients with impaired mechanisms for potassium excretion. These reactions most commonly occur in patients receiving potassium intravenously, but may also occur in patients receiving oral potassium. Potentially fatal hyperkalemia can develop quickly and be asymptomatic. Patients using potassium salts with chronic renal disease, or any other condition which impairs the excretion of potassium, require especially careful monitoring of serum potassium concentration and appropriate adjustment of dosage. PRECAUTIONS: General Precautions - The diagnosis of potassium depletion is ordinarily made by demonstrating hypokalemia in a patient with a clinical history suggesting a cause for potassium depletion. When interpreting the serum potassium concentration, the physician should be aware that acute alkalosis can cause hypokalemia without showing a deficit in total body potassium. Acute acidosis can increase the serum potassium level to normal even with a reduced total body potassium.. Thus close attention to acid-base balance, serum electrolytes, the clinical status of the patient, and the ECG is required in the treatment of potassium depletion. Information for Patients - Patients should be instructed to dissolve each tablet completely in the required amount of water to reduce the risk of gastrointestinal irritation associated with the oral use of concentrated potassium salt products. Patients should not open foil pouch until time of use. Laboratory Tests - Serum potassium determinations and ECG should be part of the frequent clinical evaluation of the patient. Drug Interactions - Severe hyperkalemia can be produced by the simultaneous administration of potassium supplements and a potassium-sparing diuretic (see Contraindications). Potassium supplements should be used carefully by patients who are using salt substitutes, because many of these substitutes contain large amounts of potassium. This simultaneous use could produce hyperkalemia. Usage in Pregnancy - Pregnancy Category C - Animal reproduction studies have not been conducted with this effervescent potassium product. It is unknown whether this product can cause fetal harm when given to a pregnant woman or if it can affect reproductive capacity. Pregnant women should be given this product only if it is clearly needed. Nursing Mothers - Because many drugs are excreted in human milk, there exists the potential for serious adverse reactions in nursing infants from oral potassium supplements. Therefore, it should be decided whether to discontinue nursing or to discontinue the drug, considering the importance of the drug to the mother. Pediatric Use - Safety and effectiveness in children have not been established. ADVERSE REACTIONS: Abdominal discomfort, diarrhea, vomiting, and nausea are the most common adverse reactions tooral potassium supplements. These adverse reactions occur most frequently when the preparation is not taken with food, is not properly diluted, or not completely dissolved. Hyperkalemia occurs infrequently in patients with normal renal function who receive oral potassium supplements. The following are symptoms of hyperkalemia: mental confusion, unexplained anxiety, cardiac arrhythmias, numbness or tingling in lips, feet, or hands, difficult breathing or shortness of breath, weakness or heaviness of legs, and unusual fatigue or weakness. (See Contraindications, Warnings, and Overdosage). OVERDOSAGE: The use of oral potassium salts by persons with normal renal functions rarely results in serious hyperkalemia. However, if excretory mechanisms are impaired or if potassium is administered too rapidly intravenously, potentially fatal hyperkalemia can result (See Contraindications and Warnings). The earliest clinical signs of hyperkalemia may be only increased serum potassium concentrations and characteristic ECG changes, such as depression of S-T segment, prolongation of the QT interval, peaking of T-waves and the loss of P-wave. The above mentioned changes in the ECG most frequently occur when the serum potassium level gets to 7 to 8 mEq per liter. At a level of 9 to 10 mEq per liter, other clinical manifestations may occur, such as muscle paralysis and death due to cardiac arrest. The focus of the treatment of severe hyperkalemia should be on the reduction of the serum potassium level by furthering the transfer of potassium from the extracellular to the intracellular space. The treatment may include the following: a) intravenous administration of 1 liter of a `0 percent glucose solution which contains 20 to 40 units of insulin; b) in the acidolic patient, 150 mEq to 300 mEq of sodium bicarbonate administered intravenously. Other actions should include the discontinuing of potassium-sparing diuretics and potassium-containing drugs and often the oral use of a cations exchange resin (such as sodium polystyrene sulfonate) in order to eliminate gastrointestinal potassium. To make sure that the resin moves rapidly through the gastrointestinal tract, a nonabsorbable polyhydric alcohol such as sorbitol should be administered in sufficient amounts to cause a soft to semiliquid bowel movement to occur every few hours. Hemodialysis can also be used as an effective alternative means to remove excess potassium. 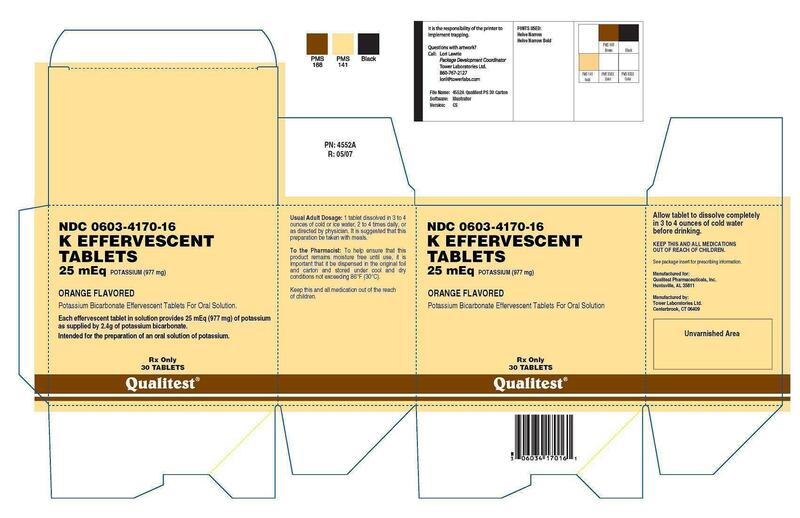 DOSAGE AND ADMINISTRATION: Adults - One effervescent tablet (25 mEq potassium) completely dissolved in three to four ounces or more of cold water and taken two to four times daily, or as directed by physician. It is suggested this potassium solution be taken with meals and sipped slowly over a five to ten minute period. Do not open foil pouch until time of use.